On the afternoon of January 18, Mr. Sun Yuxi, the new Ambassador Extraordinary and Plenipotentiary of the People's Republic of China to the Republic of India presented his Letter of Credence to Mr. A.P.J. Abdul Kalam, President of India. 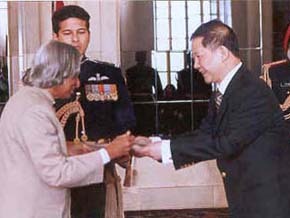 Later, President Kalam held cordial and friendly talks with Ambassador Sun Yuxi. Ambassador Sun first conveyed Chinese President Hu Jintao's cordial greetings to President Kalam and extended best wishes to the Indian government and people on behalf of the Chinese government and people. Ambassador Sun expressed his appreciation and admiration for the striking achievements and developments of India in the fields of economy, science and technology, culture and education, sincerely wishing the Indian government and people would achieve more accomplishment in the national construction. Ambassador Sun noted that China and India were good neighborly countries linked by common mountains and rivers. The population of the two countries totals up to 2.4 billion, exceeding one third of the world's population. Mutually beneficial cooperation between the two countries would not only serve the shared interests of the two peoples, but also contribute to peace, stability and development of Asia and the world at large. Ambassador Sun expressed that he felt honored to be appointed the Ambassador of the People's Republic of China to India and was fully aware of his great responsibilities. He would exert all his efforts to expand and deepen good-neighborliness, friendship and mutually-beneficial cooperation, enhance the mutual understanding and friendship between the two governments and peoples, and bring China-India relations to a new high. 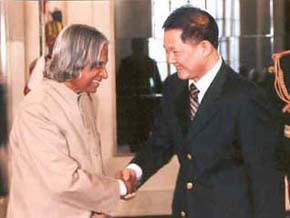 President Kalam also asked Ambassador Sun to convey his cordial greetings to Chinese President Hu Jintao. He briefed Ambassador Sun that India had a large population and was faced with the urgent task of economy development and poverty alleviation. India and China had many similarities. Strengthening friendly cooperation between the two countries was crucial to the development of each country. President Kalam also stressed the importance of the people-to-people contacts in developing bilateral relations. He hoped that there could be more exchanges between students, teachers, scholars, scientists and other personages from different circles of the two countries so as to develop bilateral relations in an all-round way. 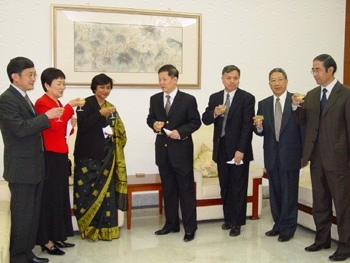 Ambassador Sun Yuxi arrived in New Delhi on January 12 to take up his new office.